girls’ weekend! that’s right, kari and i were taking an early weekend as of last friday around, say, one p.m. to make a visit back to the windy cindy. mark and kathleen’s son, and our good friend, gregory moved here to chicago earlier this year, and we decided he needed some company. here we come! after a long and busy week, a short friday always makes things a touch better. kari and i met up at terminal c, ‘c’ as in chicago, with just enough time to grab an adult beverage before the flight. we stopped at burgers, bbq, and brews for some shock top and caught up on work, weddings, and all the things that best friends gossip about with each other. up top! “last call for ticketed passengers on flight 2469 to chicago-midway.” that was our cue! our tickets were scanned, the flight was packed, and we made our stroll to row 24. all these poor folks around us; they just don’t know how much fun we will be! as we settled into seats a and b, the tunes of john legend, john mayer, and macy gray serenaded us. we threw our sunglasses on because, you know, we’re future celebrities, and immediately pulled out skymall. i swear, some of the stuff in this magazine has been in there for a solid ten years at least, if not longer. classic items include the big foot statue for your yard and the three-step stool to help your dog get up onto the bed. am i right? it was a sunny afternoon as we soared into the northbound skies. chicago isn’t too far away, by plane, so kari and i didn’t have to put on too big a production to entertain ourselves on the short flight. cabin service rolled down our way, and two more beers were in order. blue moons, please! they would go perfectly with the cvs-brand chocolate-covered pretzels kari had brought aboard. our anticipation grew as the plane descended into illinois. we were just so excited to be back in chitown! our last visit was a couple of summers ago, and it set a high bar for this return trip. i collected my 43-pound suitcase, kari grabbed her much smaller one, and we wound through the airport to find the metro station. it was a delightful stroll thanks to the local art that had been installed all around on the walls. i’ll say this one thing right now: the train ride into town was quite an adventure. rather than purchasing a single, reloadable card with six trips, we ended up buying six individual paper tickets for the rides. whoopsies! thankfully the train from midway only goes one way, so we couldn’t mistake that direction at all. we hustled off the orange line, dragged ourselves down several flights of stairs, and hopped on the red line towards town. six stops later, we found ourselves right in the midst of a bustling rush hour. after a short walk, we turned right on east walton and there it was. THE DRAKE. a good thing to come of all my work travel is that i quickly catapulted to the diamond hilton honors level. all those nights and points paid off, and we were able to treat ourselves for a couple of nights at this historic hotel. it’s a cold winter in chicago, new year’s eve 1919. the hard work by financers john b. drake and tracey corey drake have come to fruition through the vision of architect benjamin howard marshall as the drake opens its doors for the first time to 2,000 prestigious and distinguished citizens. the drake set the standard for opulence and indulgence during the 20s, hosting icons such as bing crosby and even walt disney. time may have tested this landmark’s flexibility through changing seasons and history, but it has stayed true to its original glory throughout the years. if you find yourself lucky enough to stay in one of their glamorous rooms, be sure to take in all the richness of the drake. it truly is more than a hotel; it’s an experience very much worth the while. we met gregory, ben, and kasia in the drake lobby, quickly hugged, and even more quickly decided we were all hungry for some dinner. we roamed around the streets, not sure of what we were craving. things at the cedar hotel seemed to be pretty happenin’, and we figured we should be a part of it. well, this place was frat-tastic, except a degree up, or maybe down? i felt like i was in some grown-up version of a downtown college town bar. but hey, they were serving up strong 7 & 7’s, so i was on board. overall, here is what i will tell you about the cedar hotel: the service was fine, the food wasn’t anything terribly special (actually, the sweet potato fries were very delicious), and the atmosphere was, well, rowdy. i expect the cedar hotel is a place you come after you’ve already had few. you feel? we paid our checks and squeezed among the tables full of waffle fries and beers to the sidewalk. where to next, you ask? well, we weren’t ready to call it a night just yet, so yelp directed us to a friendly neighborhood bar, the lodge tavern. this is the place “that started it all” as they say, back in 1957 when they first opened their doors. 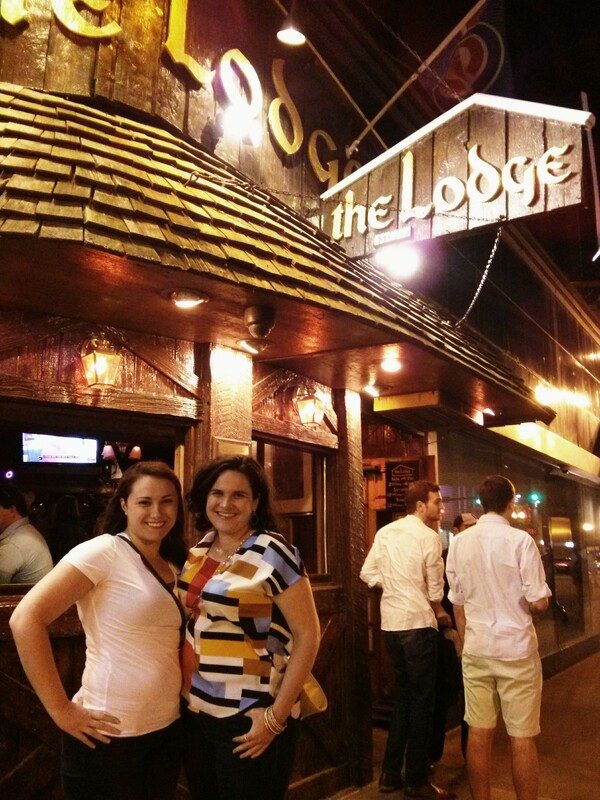 the lodge tavern truly is a chicago landmark, and i was ecstatic that we were there. it’s a cozy spot that wasn’t too overcrowded early in the night on a friday. the bartender was kind and attentive with a warm smile. and the other guests? well, they were characters of a different kind. i expect that had we stayed much later, we would have seen some very interesting spectacles. after another drink, kari and i declared it was time to hit the hay. the first night coming to a close meant one thing: night two was not far away!